In Social Learning Theory, Sheida Soleimani scours Internet news searches for images of Iranian women who have been unjustly executed due to their political and/or religious views by the Iranian Sharia Court. These found documents, often obscured and pixilated, are used as direct imagery in the three sculptures and five photographs presented at the gallery. 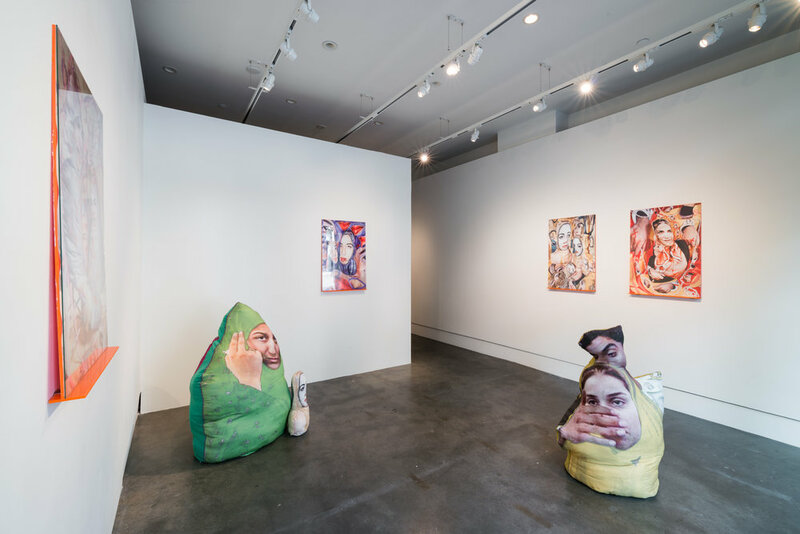 Printing her images on cotton, Soleimani creates soft, weighted sculptures based on bobo dolls used in psychologist Albert Bandura’s 1961 ‘Bobo Doll Experiment’ on observational psychology and social learning theories. In this experiment, these dolls were positioned to absorb the aggression of children following a set of rewarded behaviors. Soleimani positions her dolls to represent the absorption of violence taken on by Iranian women. These soft sculptures are then placed back into her photographic tableaus in which she creates various scenes that address the theatricality and spectacle surrounding state-sanctioned assault. The daughter of political refugees that were persecuted by the Iranian government in the early 1980’s, Soleimani inserts her own critical perspectives on historical and contemporary socio-political occurrences in Iran. Her works meld sculpture, collage, and photography to create collisions in reference to Iranian politics throughout the past century. By focusing on media trends and the dissemination of societal occurrences through the news, source images from popular press and social media leaks are adapted to exist within alternate scenarios. Sheida Soleimani (b. 1990) is an Iranian-American artist currently residing in Providence, Rhode, Island. Recent solo presentations of her work include To Oblivion (Edel Assanti, London: 2016), Civil Liberties (BOYFRIENDS, Chicago: 2016), National Anthem (Biel/Bienne Festival of Photography, Bern: 2016) and To Oblivion (186 Carpenter, Providence: 2016). Soleimani’s work has been presented in group exhibitions at Club Pro (Los Angeles: 2017), UNTITLED Art Fair, (Andrew Rafacz Gallery, Miami, 2016), ROMPONE (Cologne: 2016), S1 (Portland: 2016), the Goss-Michael Foundation (Dallas, TX, 2015) and the Contemporary Art Center (Cincinnati: 2015). She is a 2017 MacColl Johnson Fellowship recipient and was an artist in residence at the Center for Photography in Woodstock, NY in 2016. Soleimani is represented by Edel Assanti in London.